I would like to use Office 365 for SMTP delivery instead of the built-in email relay server. How do I have to set up the notification delivery settings in PRTG to send emails via Office 365? You can send out email notifications from PRTG with Office 365 as SMTP relay server if you do not want to use the built-in SMTP relay server for direct email delivery. To set up PRTG email delivery with Office 365, provide Notification Delivery settings in PRTG as we outline below. Open the PRTG web interface with a browser. From the main menu bar, select Setup | System Administration | Notification Delivery. In section SMTP Delivery, use the following settings. Sender Email and Sender Name: Enter the email address and the name that will appear as sender of your email notifications. HELO Ident: We recommend that you use the DNS name of your PRTG server. SMTP Relay User and SMTP Relay Password: Enter the credentials for the mailbox that you use with Office 365. 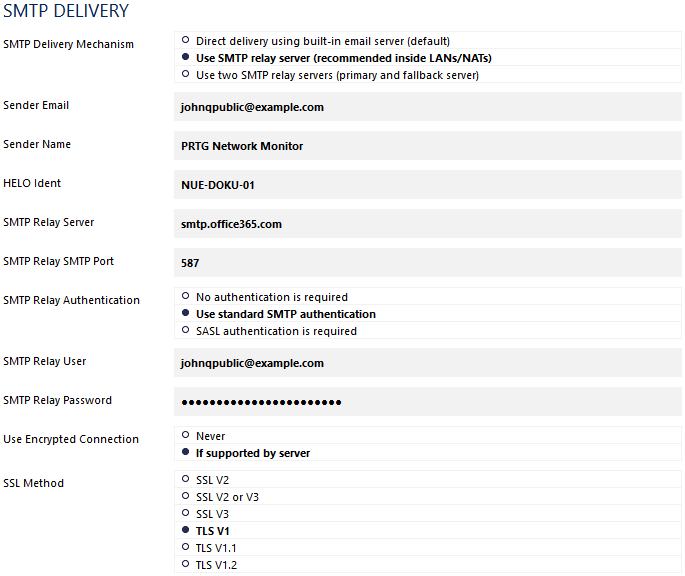 Test the SMTP delivery of email notifications. Open Setup | Account Settings | Notifications from the main menu bar in the PRTG web interface. Look for an email notification for which you are defined as a receiver (for example, the default notification Email and push notification to admin). Check your mailbox for the test notification. •	Can Gmail / Google Apps be used for SMTP relay? I can't find the test email button - did it location change? Please navigate to "Setup > Account Settings > Notifications", mark the notification you desire via the checkbox on the right side and click the "bell"-icon in the appearing menu on the right side.